The Arcola has had something of an unofficial Russian season of late, what with Anna Karenina and Uncle Vanya, and so their attention now turns to Chekhov’s classic play Seagull (the definitive article is clearly passé this year what with Government Inspector losing it too) with Runaway Theatre, using a new translation by Charlotte Pyke, John Kerr and Joseph Blatchley, the latter of whom is also the director. Set in 19th century Russia, the story revolves around four artistic types: fading actress Arkadina, young ingénue Nina, successful writer Trigorin and would-be playwright Konstantin and their complicated loves and lives between each other and those around them. When Konstantin puts on a play for the two women in his life, it acts as the precipice for a tragic set of consequences as all strive for emotional happiness and artistic freedom, yet despair and failure are never far away. With this new translation that adhered word-for-word to the original text, it was discovered that some cuts and amendments had been made by the Russian censor back in 1896 and these have now been restored. It doesn’t quite mean there’s now Tarantino-levels of swearing and violence, indeed I would reckon even Chekhovian scholars would be hard-pressed to notice all the changes as many of them are relatively minor, but adding layers of subtlety to characters and a touch of clarity to relationships that contribute to the overall feeling of freshness to this interpretation. For that is the major achievement of this production, it has really reinvigorated Chekhov’s classic and lent it the excitingly powerful, persuasive air of seeing something clearly for the first time. That it manages this without resorting to the crude modern language that Andrew Upton adopted for the National Theatre’s The Cherry Orchard is all the more impressive as Seagull’s energy and directness in its dealings with love and ambition and how so much of our efforts end up in disappointment and frustration, demonstrates just how timeless the original is. 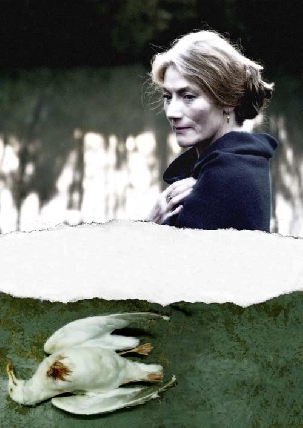 It really is an ensemble show, though the role of Arkadina is one which attracts the highest calibre of actress, and here we have Geraldine James working genuine magic as the self-absorbed resting actress, unaware of the impact she has on those around her and how that ripples out, particularly in her rubbishing her son’s work in order to make herself feel better. Her relationship with Al Weaver’s pale, goateed Konstantin is gorgeously played, his neediness for her attention, her desperation for his forgiveness, the scene as she redresses his head wound but end up fighting is just spell-binding. She also connects superbly with Matt Wilkinson’s handsome Trigorin, who looks just the part, in her manipulations to keep her younger lover by her side. But it truly is about the ensemble and the multiple tangled love connections. Jodie McNee’s snuff-taking matter-of-fact Masha is a brilliant beacon of fierce intelligence, brushing aside Medvedenko’s puppyish affections and sensing an intellectual connection with Trigorin, whose shared humour is so touching, but suffering a broken heart from her unrequited love for Konstantin. He in turn holds the brightest candle for Nina, a startlingly assured performance here from Yolanda Kettle, but she only has eyes for Trigorin, Wilkinson lighting up from inside at what she inspires in him. These inter-relationships are observed and commented upon with a crinkly wry humour by the old guard, represented excellently by Roger Lloyd Pack as Dorn and Will Knightley as Sorin, Gabrielle Lloyd also adding to voice of weary experience as Masha’s mother. The lightness of touch with which they play the first three acts, even with the drama contained within, is executed so well and with such warm humour threaded throughout, that the sledgehammer of the final act, set two years later and with tragedy so firmly in the air, becomes truly disturbing. The physical transformation that McNee and Kettle make is just upsetting and the inevitability of the crushing of the dreams of all and sundry, who we’ve come to really like, makes this as devastatingly affecting as one could imagine. Dora Schweitzer’s simple set, with its grass-laid floor and scattered rugs allows Bletchley’s direction to focus on gradually increasing the emotional intensity to create a genuinely refreshing Chekhov experience.